25. 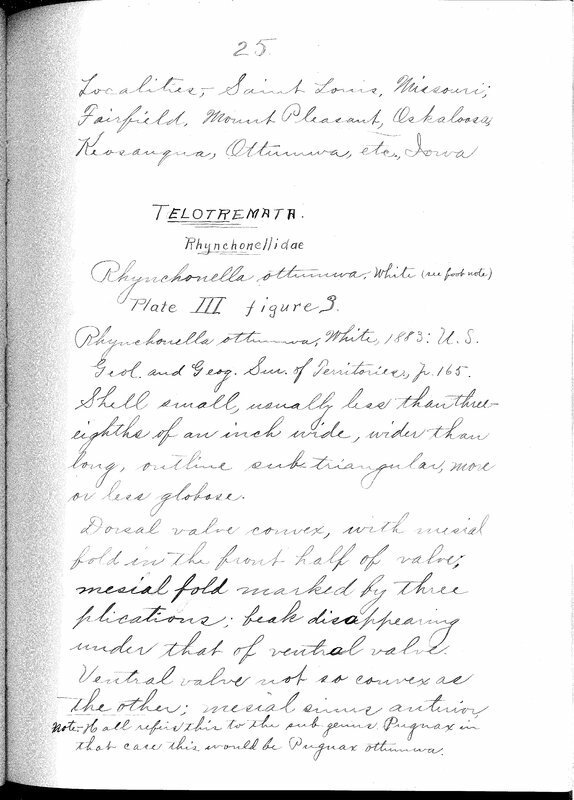 Localities; Saint Louis, Misssouri; Fairfield, Mount Pleasant, Oskaloosa, Keosauqua, Ottumwa, etc., Iowa Telotremata Rhynchonellidae Rhynchonella ottumwa, White (see foot note) Plate III figure 9. Rhynchonella ottomwa, White, 1883: U.S. Geol. and Geog. Sur. of Territories., p. 165. Shell small, usually less than three-eights of an inch wide, wider than long, outline subtriangular, more or less globose. Dorsal valve convex, with mesial fold in the front half of the valve; mesial fold marked by three plications; beak disappearing under that of ventral valve. Ventral valve not as convex as the other; mesial sinus anterior, note.- Hall refers this to the sub genus Puguax in that case this would be Puguax ottumwa.